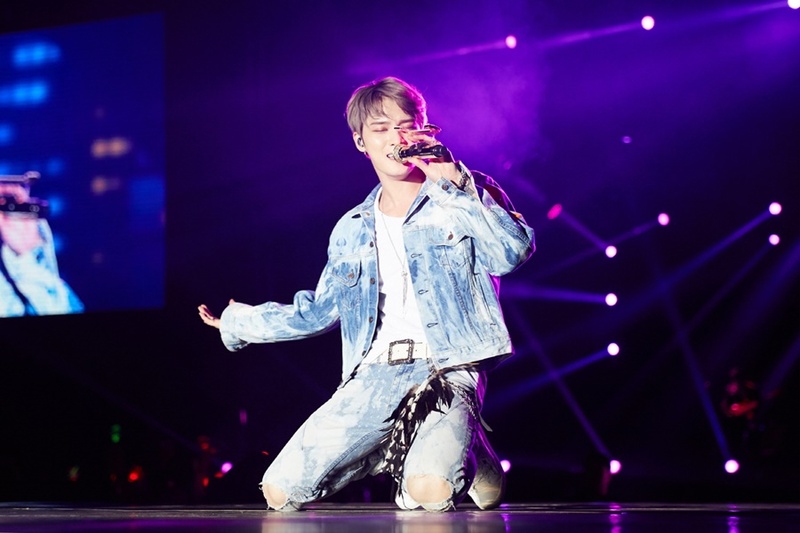 South Korean artist Kim Jae Joong will visit Bangkok for the first time in 3 years for his new concert tour The Rebirth of J. The Rebirth of J tour first kicked off in January this year in Seoul after Kim’s military service for almost 2 years. The tour then progressed in four different Japanese cities in Yokohama, Osaka, Nagoya and Saitama. Kim has just concluded his Hong Kong show in AsiaWorld-Expo Arena and gathered over 136,000 fans so far after performing 12 shows. Kim will return to Bangkok for this new tour since his last performance as a JYJ trio for the The Return of the King tour in 2014. Earlier today, the organizer for the Bangkok concert, IME Thailand, has posted a set of concert rules on their official Facebook page ahead this Saturday’s show. The list includes the banning of non-official concert merchandise and light sticks apart from red colour. This will be Kim’s first concert to explicitly ban non-red light sticks and goods other than the ones which will be sold by Kim’s agency, C-JeS Entertainment. While it is no surprise that any acts of photography and videography is strictly prohibited in the hall, the rules also mention that any sorts of banners and papers larger than A4 size is forbidden. Fortunately, a station will be set up for fans who wish to give gifts to their favorite idol. Photo, video, audio recording and live on SNS are strongly not allowed no matter by mobile phones, cameras, tablets and other recording devices. *If violation occurs, we reserve the right to delete the images, videos and audios then ask the violator to leave the concert immediately. Selfie monopods, cameras, video cameras, polaroid cameras, tablets (with over-7-inch screen), Clip Lens and other recording devices are strongly not allowed in the concert. We will have the deposit point for you to deposit those devices. However, we are not responsible for damages of the devices. Therefore, we firmly recommend you not to bring them to the venue. Light sticks or LED plates not allowed in the Concert except official goods from C-Jes [Light Sticks only Red Color]. We will have the table for leaving those items in front of the gate before entering the concert. Please note that this is not the deposit point. Folding chair, mini ladder, balloon sticks, balloons, balls, whistles, horns, megaphones, paper bigger than A4 and any kinds of banners are not allowed in the concert. We will have the table for leaving these items in front of the gate before entering the concert. Please note that it is not the deposit point. All kinds of food and drink are not allowed in the hall. Alcohol beverage, drug, weapon, edge tool, explosive and any other dangerous items are not allowed in the concert. The plastic ticket is required for entering the concert. You can get the plastic ticket and Official Poster at Ticket kiosk at Concert venue from 13.00 pm. We have the first aid area which will support you until the concert finishes. If you need help, please ask our staff at the concert to lead you to the first aid area. There is the station for accepting gifts for the artist. 2017 KIM JAE JOONG ASIA TOUR in BANGKOK ‘The REBIRTH of J’ will take place on March 18, 2017 at 6PM local time at Indoor Stadium Huamark, and doors will open an hour earlier. The All About Cassiopeia team will be on scene to conduct a special photo card giveaways for fans. Follow us on Twitter for details.